Despite being one of the most developed countries in the world, those at the lower end of the United Kingdom's financial income distribution are evidence of a relatively low standard of living, as 20 percent of all households in the UK earned less than 299 British pounds per week. Data on the distribution of total gross household income from wages and salaries in the UK illustrates that 81 percent of 25 to 34-year-olds generated incomes from wages. This was the largest distribution of any age group, demonstrating that as age increases, the share of age groups that depended on income declines. 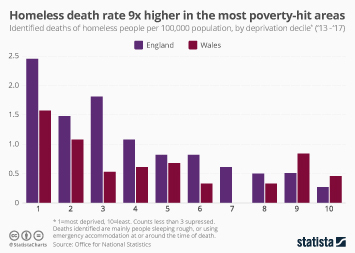 As of 2015/2016, homelessness affected almost 8.1 thousand people in the capital, based on data referencing the number of people reported to be sleeping rough in London. 85 percent of these people were male, as stated in a report illustrating the gender distribution rough-sleepers in London. Further information about the ethnic distribution of rough sleepers in London reveals that two thirds of people sleeping rough were ethnically white and 30 percent of the total number of homeless people were aged between 36 and 45 years old. The number of people reported to be sleeping rough in London in 2016, broken-down by borough shows that in Westminster there were 2 thousand people more living rough than in Camden, which had the second highest number of people living on the streets in London. More interesting topics from the industry "Demographics"